Cushman & Wakefield announced today the purchase of Arcadia Village, a CVS pharmacy-anchored, neighborhood shopping center located on the southwest corner of Camelback Road and 40th Street in the prestigious Arcadia neighborhood in Phoenix, Arizona for $19.65 million. 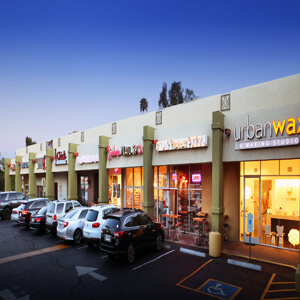 Cushman & Wakefield Executive Managing Directors Ryan Schubert and Michael Hackett represented the seller, Arcadia Retail, LLC. “Arcadia Village is an irreplaceable piece of real estate located in the heart of the Arcadia/Biltmore neighborhood with excellent Camelback Road exposure. The fact that CVS Pharmacy chose to backfill the vacant Fresh & Easy space less than a year from its closure is a testament to the long term potential of the site,” according to Executive Managing Director Ryan Schubert. Built in 1957, Arcadia Village contains 37,006 square feet of retail space. The center’s anchor, CVS, occupies approximately 48.5% of the total leasable space in the property. Additional tenants include Baskin Robbins, Urban Wax, Arcadia Village Dentist, Sundrops Nail Salon, Gigi’s Cupcakes, Giant Rustic Pizza and The Grind Burger Bar. The property was 100% leased at the time of sale.